I am passionate about many things….Interiors and Horses being at the top of the list. While the equestrian themed interior has been in style for centuries, the motif has gained strength in the past few years. The horse is symbolic in many cultures. In some, white horses stand for the balance of wisdom and power. Because riding a horse made people feel they could free themselves from their own bindings, the horse is a universal symbol of freedom without restraint. Even for those who don’t have horses, it seems to be an element that most people enjoy. Just one piece in a room lends sophistication and elegance. An equestrian interior is comprised of many elements. The motif is broad and can encompass everything from imagery of horses to horse tack and riding boots, hats and apparel. Within these categories, the theme can be English or western. 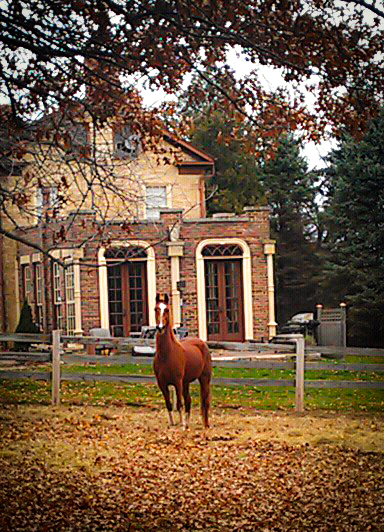 Even architecture has taken hints from the equestrian lifestyle. The barn style is rooted right here, with sliding doors that mimic horse stalls. This classic look whether English or Western can stand the test of time. It is Luxe with the rustic and casual embrace of the outdoors. It can include ancient relics of horse cultures from centuries ago as well as contemporary images of horses with a blank background. The look can be one single piece as a feature or the full-on lifestyle throughout the home. My home happens to be part interior design, part tack room as there are saddles and harnesses stored in many of the rooms. Riding boots sit next to the chair in the foyer and helmets perch atop chests and bookcases. Equestrian books fill most of the shelves in the library and great room. Beautiful photographic books are placed strategically on the shelf of the coffee table. Spare bits are used as filler in a glass bowl and old show ribbons fill glass vases. The art collection ranges from contemporary lithographs to antique to oil paintings of horses from my past. Our objective for the Black Horse Collection is to create an Equestrian Lifestyle Brand, one that allows you to echo your horse passion in all facets of your life, from your wardrobe to your house. Balancing luxury with affordability, we aim to bring this look to more than just the rich and famous. It will take time to achieve all of these goals with the Black Horse Collection, so please bear with us and check back often, as product will continue to be added. The website is operational now, even though we are delaying the official release until Fall 2017. Let us know how we do, and what it is you are looking for.